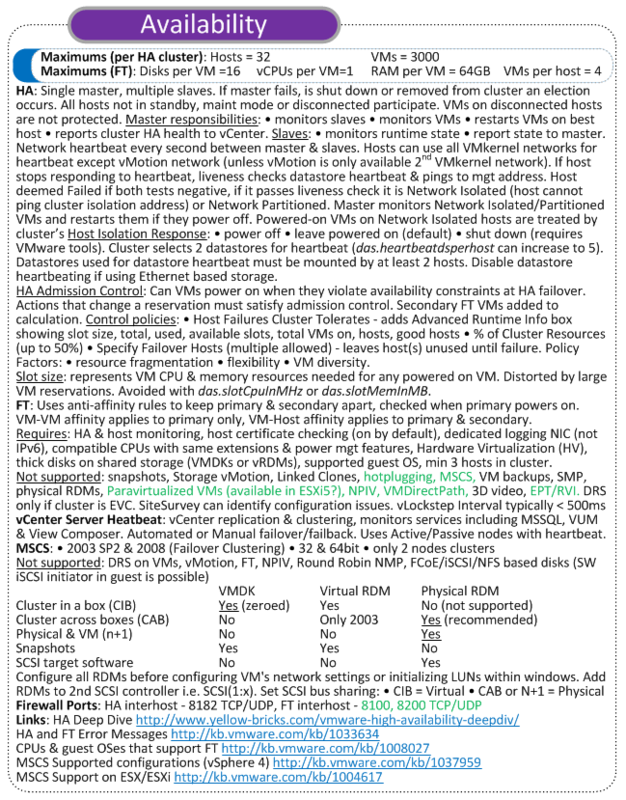 Here is a third preview of the upcoming vSphere 5 vReference Card – the availability section. As HA has been re-written (AAM > FDM), this section has quite a lot of new content over the vSphere 4 card – I’d love to hear any of your feedback. As before, the green text identifies bits that I’ve not been able to confirm yet. Unfortunately, I suspect that the MSCS stuff will need to be dropped as the card fills up to make space for other more relevant content. Just drop your comments below or catch me on twitter (@forbesguthrie). Click on the image to see it full size or you can view/print it as a PDF. Great info as usual. You really break it down simply and succinctly. Can’t wait to slap the version 5 poster up on my filing cabinet. Great work as usual, I have been using your reference cards now for some years and wondered if they could be put into a Letter/A4 format also for those of us with poor eyes. Looking forward to seeing the final product, reviewing the full notes also on my journey to update my VCP to 5. Thanks Brian. Yep I’m considering this, as it’s something that’s been requested several times over the course of previous cards. I’ve changed to using Visio to create the v5 card, so hopefully that should make it more straightforward to rescale it.